Norway is well worth a visit as it inspires thousands with its beautiful mind-blowing scenery. If you are planning a trip to Norway, be prepared to fall in love with its extraterrestrial nature, to see plenty of lakes, rocks, and famous Norwegian fjords! Fjords of Norway are narrow, deep and tortuous bays with rocky shores, which cut deep into the land. Hundreds of tourists visit Norway every year to see these magnificent places, and those, who are real fans of adventure tourism dare to float the fjords on kayaks. 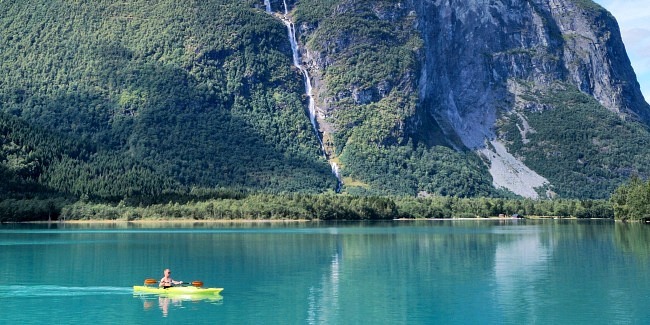 If you are one of them, consider taking a guided Norway kayaking tour to the fjords. The following top 10 list of the most attractive destination routes for kayaking in Norway will help you to finalize your vacation plans for 2017! You probably won’t believe it, but the first destination among the top places for fjord kayaking in Norway is the West Fjord, which is part of Oslo. While kayaking in the West Fjord you can escape the city bustle, immerse yourself into the variety of nature and discover the green hills near the city, passing through small islands speckled with summer vacation homes. This travel will allow you to enjoy the views of thousands of islets as well as the urban sights of Oslo, remained in the distance. Another great choice for fjord kayaking during your tour to Norway is Hidra - a flowering island with a rich maritime history. Dating back to the times of legendary Vikings, this region is called the Norwegian Riviera as this is where the channel runs along the border between southern and western Norway. Visitors usually go kayaking around the island, enjoying the serene settlements at the very water. The Helgeland coast is a real paradise for kayakers! Making a new discovery near each island of the archipelago Vega nearby is inevitable. Registered in the UNESCO World Heritage List, this area provides for a unique kayaking experience as you make your way through the potholes and small lagoons, gazing out the vast Norwegian Sea. Seals and otters are often spotted here, but are really shy. The town of Flekkefjord is protected from the wind by high mountains on all sides, straddling the narrow sound which connects the Flekkefjorden to Grisefjorden. This makes a kayaking trip here tranquil any time of the year, a requirement especially significant for many beginners. It is even permitted to paddle right in the town opening great views of Flekkefjord from a kayak. You can also go paddling through Grisefjorden which is especially enthralling since you can reach a number of lakes with swans. As a rule, a guide will accompany you during such a kayak lake tour. A Norway kayaking trip around probably the most famous Norwegian village, Flam, will impress with an appeasing fjord landscape. No kayaking experience is needed to go on such a mini-adventure during which you can paddle past Otternes Bygdetun with its old buildings and rich history out towards Fronnes renowned for ancient Viking grave mounds. One of the best destinations for kayaking in Norway is Finnøy Island that offers a great variety of kayaking options depending on the weather and kayaking skills. The territory of the island is a protected bird sanctuary home to a lot of seabirds, including the largest bird of Europe – the white-tailed sea eagle. Because entering the territory of the sanctuary is prohibited, the best way to see the gorgeous animals is during a kayaking journey. A kayaking route from Arendal to Tønsberg boasts an incredibly picturesque archipelago! This is a route for several days, but a camp can be set up almost anywhere you stop. This is a fascinating opportunity to go deep-sea fishing, enjoying the surrounding nature, swimming or kayaking. Sotra and Øygarden islands enclose mainland Norway from the North Sea, forming a severe and simultaneously picturesque landscape west of Bergen. The experience includes staying overnight in an old fishing hut, exploring every corner of this amazing landscape and kayaking into the bays to seek out sea lions, seabirds, and other marine life. Sandefjord main appeal to travelers is its variety and abundance of great places for summer holidays, sunbathing and having picnics. As in neighboring Tønsberg, there are many museums, which demonstrate the past of Sandefjord, a formerly rich and important center of the whaling industry. The general spirit of relaxation attracts a large number of people. Kayaking fjords, through the shallow water between the islands and skerries, is a unique and tranquil Sandefjord experience. And last but not least, Vesterålen is a perfect place for sea kayaking. Vesterålen is made up by a group of five large islands, interconnected by bridges. Here you can get in touch with the best of Norway: sheltered fjords, sounds, idyllic fishing villages and beaches leading down to the open sea and bird cliffs. It’s the place, which gathers active kayaking enthusiasts from all over the world. If a Vesterålen voyage is going to be your first paddling experience, a guide will surely accompany you through the landscape and the history of this area. Any tour to Norway will surprise you with the country's local flavor and make the experience there unforgettable. If you already have kayaking experience or if you feel like experiencing impressive mountains and tiny local villages around the fjords - Norway is among the most incredible places to visit..